WHY ARE SIMPLE MEHNDI DESIGNS IN TREND? 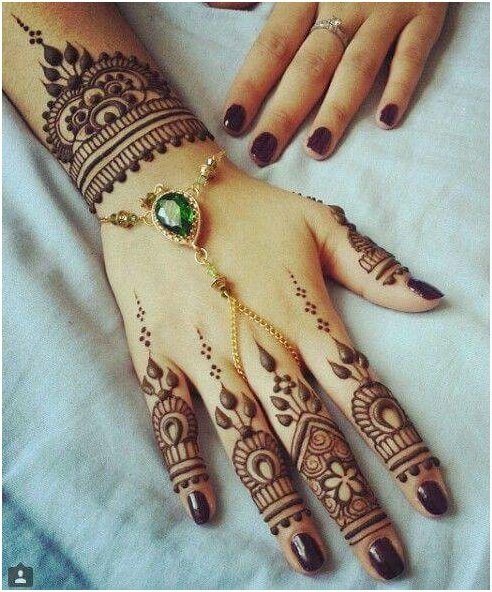 A concoction of simple yet stylish mehndi design is right here! Are you the bridesmaid this time?? Do you love applying mehndi on feet as well? Step by step Mehndi Designs is not just about getting it applied from the professionals; rather you can always give a try yourself as well. As of now; simple mehndi designs have become the talk of the town. These designs make you stand out of the crowd. There is a vast collection of simple mehndi designs on which you can not only easy to throw a try but also looks equally attractive like other mehndi patterns. Simple mehndi designs are the most demanded because they take less of time and can be applied to small and big events, both. Moreover, these designs are not that tricky and thus do not require a lot of rehearsal. All you need to do is follow step by step of these simple mehndi designs. When we talk about mehndi, nowadays girls and women look for such simple mehndi designs that they can apply themselves. Such mehndi designs are nonsticky and appear friendly to them. We bring with you the latest simple mehndi designs step by step from which you can always make a choice and download whenever you want to give an attempt. Fashion Mehndi is all about shapes and their style. So, as a newbie; the first &foremost step to learn to apply these stunning simple mehndi designs is to kick start with the learning of shapes. Dots, leaves, flowers, motifs, veils are the most commonly used forms in the learning phase. These are the base shapes of the simple mehndi designs. Half the task is done when you have become good at drawing mehndi design shapes. Then the next step would be to begin practising those simple mehndi designs that are small. Then only you could understand the trick and idea behind these simple mehndi designs. Hence, through this post your journey as the beginner to apply simple mehndi designs step by step will become quite comfortable and attractive. Follow the tutorial and unveil the creativity hidden within you. A climber of tiny rose flowers with those of sepal-like leaves is swirling from the wrists to the index finger. This is a sort of Arabic mehndi design too. If you observe keenly, the shapes are effortless to be made thereby turning this to be an appropriate simple mehndi design for the beginners. Just follow step by step, and you will be the one doing it yourself. Somewhat identical to the above one, this classy yet simple mehndi design will make you earn words of appreciation from one and all. The combination of three circular motifs connected with the green sticks is highly embellishing the back of the hand. To add on, the vertical and horizontal lines are highlighted with dots in such a way that it will draw the attention of everyone wherever you go. You are sure to fall in love with this simple mehndi design because it is effortless to be made when followed step by step. As shown; you can also add colored stones to make it a style statement. So, whether you have to go for a traditional function or a theme based, this simple mehndi design will enhance your look at both the places. Then, what are you waiting for? Here we bring you some selected and simple mehndi designs for your feet which you can apply yourself. Follow step by step so that it turns out to be a real fun rather than any hassle. When you walk, these captivating designs will take your each step closer to a new style. If you are a newcomer to the world of learning mehndi designs and also looking for few more, then your search ends here. The best part of these designs is that they are self-explainable of how to be traced step by step. You can even take the words of appreciation by applying these simple mehndi designs to your friends and relatives. Another way to head towards the simple mehndi designs is by using them in the form of a tattoo. These tattoo styles mehndi designs are the simplest of all and can even accompany you to the cocktail party with your evening gown. You can even do shading in these mehndi designs and bestow them a unique look. There are few occasions when you are short of time but need to apply mehndi compulsorily. For such festivals and events, the beneath given simple mehndi designs prove to be a great help. Moreover, the chicness of these mehndi designs will never let you stand out of date and will serve your purpose perfectly. Are you looking for such simple mehndi designs which can be applied in minimum quantity but are the trendiest of all? Here come the interesting mehndi designs which won’t let others guess that you are a newbie to this field. Also, these designs not only consume less time but also demand less perfection. So, check them out! Hope you loved all the above collection of simple mehndi designs step by step. Do give them a try and share your self-made mehndi design images in the comment section below.